To celebrate triumph with emotion is natural. To soften victorious enthusiasm in the face of heartache is dignified. 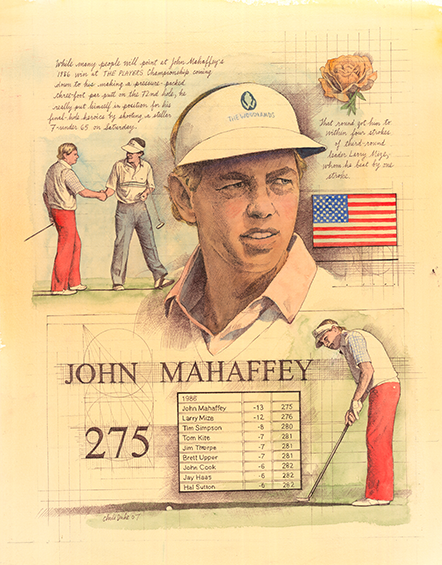 John Mahaffey smiled as he raised the trophy for winning THE PLAYERS Championship 1986. But he wasn’t new to this business. It was his ninth PGA TOUR win and Mahaffey knew sometimes you didn’t earn it as much as it was handed to you, so he acknowledged the heartache of the day. “I told Larry I was sorry,” Mahaffey said. Larry Mize by all rights should have won his first PGA TOUR tournament. Four in front to start the final round, Mize still led by three with four holes to play when the glory of Pete Dye’s THE PLAYERS Stadium Course at TPC Sawgrass took center stage. Anything can happen over those closing holes; unfortunately for Mize it was all negative, bogeys at 15, 16 and 18 allowing Mahaffey to storm into the winner’s circle by one at 13-under 275. Crushed by his closing 76 against Mahaffey’s 71, Mize conceded that he needed to learn how to close. Clearly, though, Mahaffey didn’t need any lesson in handling the situation. Jam-packed with the sport’s best players, THE PLAYERS also had a full supply of class. THE PLAYERS Championship 1986 will be remembered as the tournament that Larry Mize lost. Leading by four shots over John Mahaffey heading into the final round, Larry Mize’s lead, for the majority of Sunday, remained until a string of consecutive bogeys cost him the biggest victory of his career. On the 18th green, Mize’s misfortune continued. After a delighrful approach and chip, a miss from three feet all but gifted the tournament to Mahaffey – who parred – and it was all over, 13-under-par and one ahead of Mize.